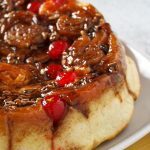 Chelsea Buns are your festive, colorful cinnamon rolls with all the delightful add-ons like raisins, pecans and cherries. In a large mixing bowl, combine 2 and 1/4 cup all-purpose flour, sugar, salt and yeast. Set aside. In a microwave-safe medium bowl, combine milk, butter and water. Heat this butter mixture in the microwave just until the butter melts. Stir and check the temperature. It should be within 105-115 F. Re-heat if necessary. Add the milk mixture to the dry ingredients in the large bowl. Use a wooden spoon and stir all the ingredients together until the dry ingredients are moistened. Add the egg. Stir mixture well while gradually sprinkling some of the reserved 1/2 cup of flour over the mixture to help with the stickiness. Once a soft dough forms and gathers in the center, stop adding the flour. You may not need the entire 1/2 cup of flour. Turn over the dough on a floured, clean surface. Knead for 8-12 minutes, or until the dough is smooth and can stretch thinly. Let it rest in a bowl, covered for 10 minutes. Stir together brown sugar, softened butter and cinnamon until the mixture turns into a paste. Spread half of this mixture on a 9-inch round baking pan. Top the mixture with the cherries, arranging them evenly across the surface. Sprinkle half of the pecans. Set the pan aside. Gently punch down the dough and roll it into a 14 x 8 inch rectangle. Spread the remaining brown sugar paste over the dough. Sprinkle the raisins and pecans evenly across the surface. Starting on the long side of the rectangle, roll the dough to form a tight log. Cut the logs into 11 or 12 equal portions and arrange each portion, cut side down over the topping in the baking pan. Space them evenly apart. Preheat oven to 200 F. Once the temperature is reached, turn off the oven. Place the baking pan with the rolls inside the oven and let it rise inside for 60 minutes. Take out the rolls and preheat oven to 350 F. Bake the risen rolls for 14-18 minutes, or until the top is golden. Let cool slightly and turn the rolls over on a serving plate to expose the toppings. Serve. Dough recipe adapted from Sally's Baking Addiction.